It’s the question on everyone’s lips, what’s the housing market going to do over the next 6 months with Brexit looming at the end of March? It’s a difficult call, as so many parts of the UK vary in terms of activity levels, supply, buyer demand and other local economic factors. The Midlands has generally bucked the trend with both greater activity and modest price rises in some areas. 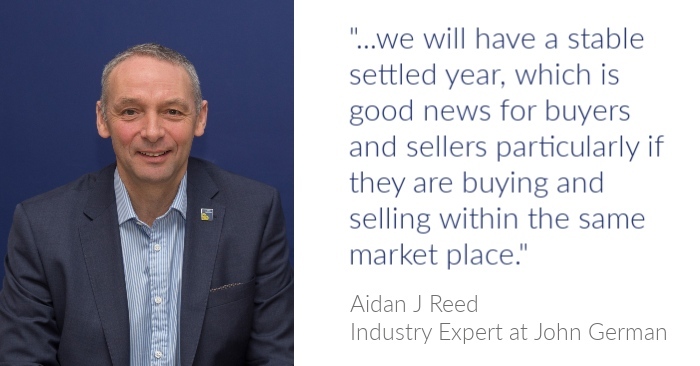 Phil Sandbach – Director at John German says “We had a very strong last quarter of 2018 with record sales in a number of locations in December. Whilst buyer activity had been stronger in previous January's, the signs are encouraging.” He goes on to say “For us it is business as usual, people are still going to move based on life circumstances, hopes and aspirations, the one certainty we have is the low interest rates, high rates of employment. The UK had a very similar situation with a deadline date similar to that of Brexit in the year 2000. Many predicted that as we turned into the millennium, there would be Armageddon with our IT infrastructure falling apart. There were years of doubt and worry but as it happens, as we turned into January 2000 it was business as usual, and people carried on with their normal lives. Considering moving home, get in touch with your nearest John German branch for further advice. "Dear Sarah, thank you so much for your invaluable help in purchasing Pye Barn. As soon as I realised we had a hold up it was very reassuring to know that you were there to move things along. You have been friendly, always courteous and professional and a star!" How to know if a property is a good buy to let? How can I sell my house quickly? Ashby Easter Egg Hunt Leads to John German! LANDLORDS! Could the new EPC legislation from April 1st hit you with a substantial fine? What makes a Propertymark Protected agent, like us, different? How to move house with pets? Is selling my house in the winter a good idea? Ashby's FABulous comes to John German Estate Agents 1920's-style! First time selling a house what do I do? Ever dreamed of running your own holiday/short-term let? A sale has been agreed, what happens next? Well, well, well, what have we got here? Do I need a survey if I've had a mortgage valuation? Moving to a new house with children - Turn it into an adventure! Looking to buy a house or remortgage? Adam can help! How do I decide on accepting an offer? The house buying process, where do I begin? What are energy performance certificates (EPCs)? And why do we need them? What are my legal responsibilities as a Landlord? Choosing a letting agent : A landlords guide. Add value to your home - Is it time to upgrade your bathroom? House been on the market for a while? How to generate more interest in your property. Which John German team did Christmas best? Christmas gift ideas for home movers! Who can buy through shared ownership? Well done to the John German runners at the Abbots Bromley 10k! Relocating area? Top tips to help ease the stress of moving! What's to love about the vibrant market town of Loughborough? Over 55 and considering moving house, but can't quite find the right one? Help set a Guinness World Record - 1300 friends & family required! Long Whatton; A picturesque village set on the border of Leicestershire countryside. Giant plant provides a superb centre piece for our vendors lawn! Loughborough vs Ashby - Where would you prefer to live? £7,700 raised for our chosen charities! Small town - big spirit : Why Shepshed is up and coming! Always dreamed of keeping alpacas? Searching for a period property to buy? Or looking for stylish interior design ideas for your own Victorian home? East Leake - Our pick of the week! Traditional Agent or Online Agent; Who should be selling your home? Is 'broken-plan' the new 'open plan'? Keep missing out on your dream home? Avoid making a big mistake ! Why choose an NAEA estate agent? We Love Our Vendors Pets! Instructed to completed in one month : yet another happy Lichfield customer! NUMBER 1 SELLING AGENT in Burton and East Leake within the last 12 months! Which home improvement can potentially add 20% to the market value of your home? They're selling like hot cakes - Why is Kegworth, Derbyshire so popular! Plenty of viewings but no offers : why? Buying a property with friends - what do you need to know? John German's Youngest Member - Baby Bennet! Who should do the viewings on your home? Why Should I Choose John German To Sell My Home? Property Surveys - A clear and impartial guide. Looking for a buy-to-let property? Proposed Stamp Duty Changes, Could Now Be the Time to Sell? Help To Buy: ISA - How does it work? Selling your home in winter : Get ahead of the game! Gun Powder, Treason & Plot! Why Should I Register With An Estate Agent? Who Will Buy My House? Do I need an Energy Performance Certificate? SOLD In West Bridgford - Should We Be Selling Yours? To furnish or not to furnish...? Our 175th Anniversary fundraising year has well and truly begun.